I'm not even sure where to start with this car. It's a 1987 924s in rough shape and I bought it on a bit of a lark as a project car. It started up on the lot, but was blowing a lot of coolant out of the overflow. The oil is now foamy, milky white. It wouldn't start to get it off the trailer either. Am I incorrect for assuming I have 2 or 3 immediate issues here? I've had blown head gaskets before on other vehicles and recognized the milky oil straight off, but the lack of ignition is what baffles me. It started enough to get it up onto the trailer, but not when I got it home. Is the pressure on the cooling system a symptom of a failed gasket or could it be something else separate from everything else? Trying to triage this machine has me scratching my head and swearing quite a bit. If at first you succeed, failure is imminent. I forgot to mention that I read somewhere (maybe the reason I stumbled upon and joined this forum) that the 924s prone to head gasket failure. As you can see the cylinders are surrounded by the water jacket. 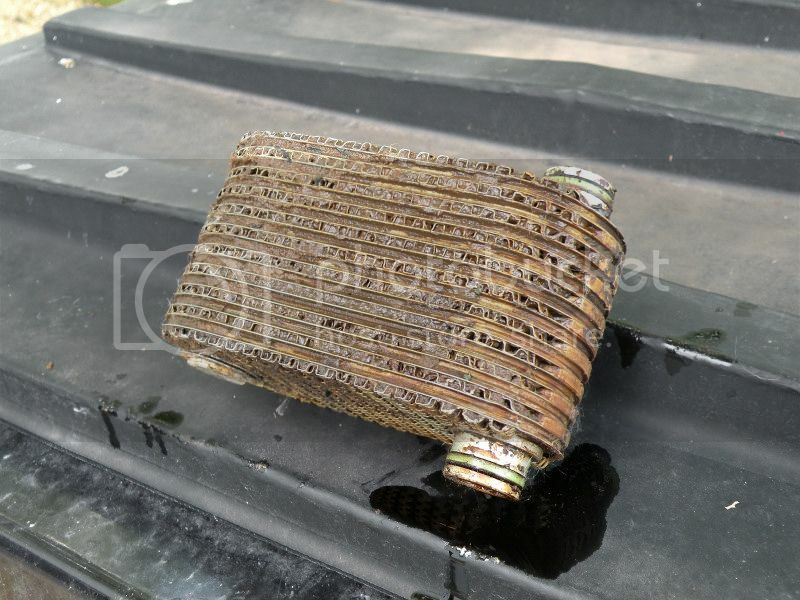 A failure at any point can push compression into cooling system. It can also pull antifreeze into the cylinder and foul the plugs. Probably why it won't start now. I just noticed that you are in Missouri. Where at? I am about 40 miles west of St.Louis. I'm about 100 miles west of St Louis in Rolla. I've been to and through Catawissa a few times. The practical side of me told me not to pick up this 924, but here I am. From the little bit of poking around I have done on this forum, I've come to the conclusion that I've bought the easiest mess to work on that I could have. So I wasn't too far off base with my assessment. I planned on new plugs, plug harness, filters, and a gasket job straight away. I'll post up on a new thread with pictures of this rough 924 of mine. Posted: Mon Jun 19, 2017 2:06 pm Post subject: 924S Heat gasket fixed , Bar's works. I purchased mine about 3 weeks ago. Same situation, engine won't start. I pull the spark plug to check, found # 3 cylinder full of coolant. I keep the # 3 plug out, and crank the engine. Stream come out from the Spark plug hole. About one minute, engine start and idle. I let it run for a few minutes. I went to buy a can of Bar's Head gasket repair. I drain about a quart of coolant, and pour about half can of Bar's to top Radiator hose(Not to the Reservoir), fill with some new coolant. Start the engine, a lot of white smoke from the tail pipe. 15 Minutes still white smoke. I stopped the engine, let it cool down. I remove the # 3 plug , let the Bar's dry overnight. Next day, I add the other half Bar's to radiator thru the top hose. put the #3 plug back, start the engine. About 5 to 10 minutes, white smoke stopped. Then, I did oil change, almost 1 1/2 gallon milky oil. rebuilt all the fuel injectors and clean the throttle body. So far the engine is running very smooth. Tail pipe is dry. I just check the spark plugs yesterday, they are all dry, not even oil. UPDATE: I finally caught a solid day to really dig into it. I found several issues I'll have to address separately from the head gasket on way through, but once I was down to the cylinders, I made a bit of a strange discovery. The gasket appeared to be brand new. It WASN'T stuck to the head or block like the other gaskets and didn't show any obvious signs of failure. The coolant around the cylinder walls was bright green and not the milkshake I found in the cam. I'm completely baffled. I'm hoping it's a not a warping case but I ran out of daylight to check it out completely. Hoses and brakes are next on my list provided I don't run into any other issues around the block. How's the oil cooler look? Solid mud-looking, or clean? From my car, and no white smoke from engine. I haven't gone that deep yet. I'm going to break out the feeler and straightedge next chance I get and while I'm at it check everything for sludge buildup. Thinking about it... Could that cause the weird internal back pressure issue?